I should have named my cats Lucky, Fortunate, and Charmed. All three were rescued from stray-dom, and now live a dry, protected, well-fed, and healthy existence. They receive regular scruffing and head pets if they so choose. There is no chance that, as they lay in a sun puddle by the window, anything dire will happen. My cats even have an outdoor room built just for them so they can go out to watch the birds and roll in the dirt, despite the sideways looks from some of my neighbors. Hello! I live in a drainage culvert. So, when I encounter stray cats like this sweet, little black kitty, I feel sadness and shame. Sadness because I can tell she’s not getting the health care she needs, or the best nutrition, or shelter from the heat or rain. As far as I know, she’s the only kitty who lives in this culvert, at this gas station, in this wealthy, gated neighborhood area in San Antonio, Texas. Shame because my cats live the feline equivalent life of the 1%. Black kitty could be considered lucky among the feral and stray cats. I asked the gas station attendant who tended to her, and was told that she gets plenty of food and water from the kind people who work there, and from people in the nearby neighborhood. That’s good. There are many, many people who care about animals. This black kitty is a true feral. She would not respond with purring to a scruff on the head, even if you could approach any closer than about 8 feet. I can’t possibly help every kitty in the world. I understand that change comes one kitty at a time. 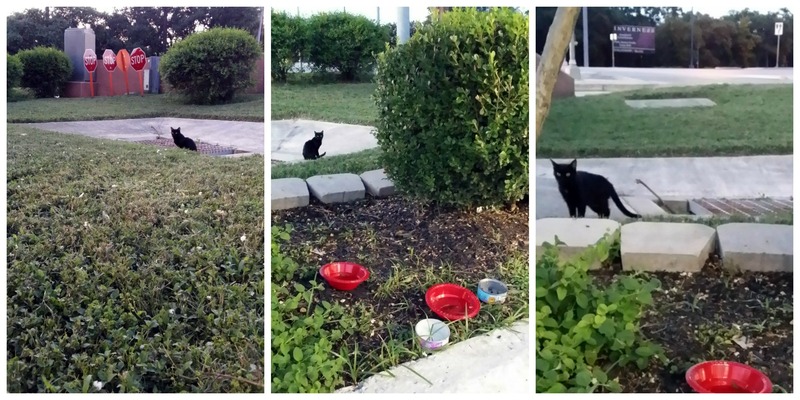 I also know that this black kitty’s story plays out in thousands of culverts, parking lots and abandoned buildings all over the country, and that not every kitty is faring as well as this San Antonio gas station kitty. I try not to be overwhelmed, and give my support where I can. Here’s a scruff for all kitties, everywhere. 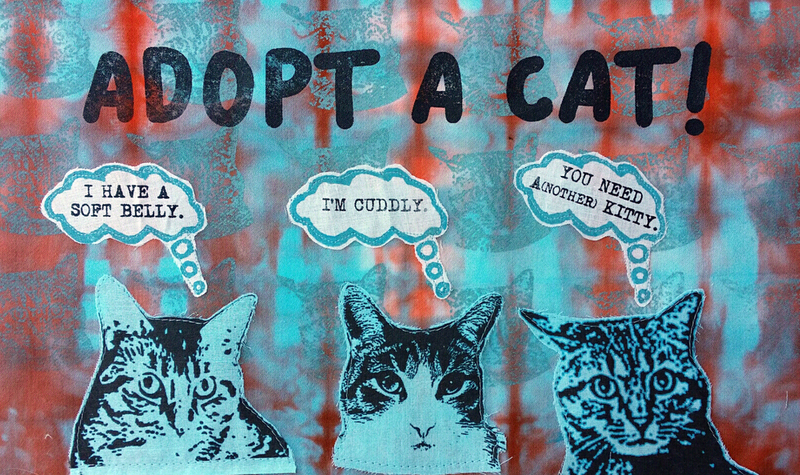 June is Adopt-A-Cat Month here in the United States. A brilliant and worthy celebration! So, why have I waited so long to celebrate? Lack of direction? Indifference? Too busy? NO! Just wasn’t sure how to properly honor such an awesome event…so, I finally made a work of art to show my support. Adopting a new kitty, or adding some more to your collection, is the obvious way to celebrate Adopt-A-Cat Month, but if you simply can’t for practical reasons, then there are other ways to help. Volunteer at your local shelter as a cat caretaker, helping in the socialization (this means petting and playing! ), care, and well-being of cats until they are adopted. Donate your dollars to cat rescue sites in your area. Many rescue agencies are run by individuals or small groups who personally assume the monetary burden of rescue. During the summer months, they are often saturated with kittens and need additional donations of food, old towels, carriers, cat toys, and cat litter. Some areas sponsor trap, neuter, and release programs to help moderate and maintain feral cat colonies. Before I moved to Michigan, I was the Sunday night feeder for feral cats who lived in parking lots at nearby businesses. I supplied the food, and my husband and I would drive around just after dark every Sunday and leave food for groups of spayed/neutered colonies. Sometimes we would find new cats, or new kittens, which would then get trapped, neutered, and released back into the colony. Captured kittens were often adopted to good families! While June is the official Adopt-A-Cat month, I think that every month should be Adopt-A-Cat month! I love cats and will advocate for happy, healthy, well cared-for cats with glee and passion. We all need a(nother) kitty!